Is Your Kitchen Not Working For You? Improve Its Efficiency With These Useful Tips! Out of all the rooms in our house, the kitchen is probably the most important. Not only is it where we spend time preparing the food that gives us everyday sustenance, but it's often the social hub of the household. The kitchen table is where your kids do their homework, and it's where you and your friends sit around with a bottle of wine if you have a dinner party. With all that in mind, it makes sense to ensure that your kitchen is as efficient as possible. But if you dread going in there to start cooking, you might want to carry on reading. A messy kitchen with outdated equipment probably won't produce the most amazing food. Plus, if you find being in the kitchen stressful, you will start to associate negative feelings with cooking, meaning you may try to avoid it in future. Cooking is a life skill you can pass down to your children, so it's important that you are passionate about it. After all, this passion is only going to rub off on them. If you need to re-work the way your kitchen operates but don't know where to start, here are a few tips to get the ball rolling. This is at the more extreme end of the scale - for those people who's kitchens have been failing them for a long time. If limited space is an issue in your kitchen, you might want to consider an expansion. For example, if you have a large family or if you entertain a lot, getting an extra oven installed could save you a lot of time and stress. It might seem ridiculous at present, but once it's in there, you'll probably wonder how you ever managed before! Having enough preparation space is also an issue for many families. There's nothing worse than have your worktops so full of ingredients, pans and packets that there's barely enough room to chop up a carrot. Consider getting an extra kitchen island installed - or, get a hidden pull-out work surface so you can keep your kitchen compact. Chances are, you probably have a pretty healthy collection of cookware. Pots, pans, trays, ramekins - open any kitchen cupboard and you'll probably find them all piled up on top of each other. But sit back for a second and think about what you actually use out of your collection. If you have a huge wok taking up lots of room, but you don't intend to ever cook a stir-fry in your life, it needs to go. But it's also vital to consider the usability of the products you do want to keep. Notice that all your frying pans are scratched and peeling on the bottom? You may think it's just harmless wear and tear, but there is actually a more sinister side to this occurrence. If your pan is 'non-stick', this is probably the coating coming off. Unfortunately, this can inject toxic fumes into your food when you cook with the pan, and may affect the taste of it too. If you are in any doubt, it's best to replace your old pan with a new one from somewhere such as www.stonefryingpans.com. Ever tried to cook with small children around? It's not an easy task at all. You may be the only adult in the house at that time, meaning you need to have one eye on your little ones and one on the food. But children don't understand the dangers that an active kitchen can pose them. Unfortunately, even the smallest oversight can lead to a potentially horrible accident. Thankfully, there are methods in place that enable you to enjoy your kitchen with your children without putting them in any danger. If your little one has a penchant for going in various draws and cupboards, buy some padlocks and lock any potentially hazardous ones overnight. Sit down with your child and have a gentle conversation about the things in the kitchen that they aren't supposed to touch. Encourage them to ask you if they want anything, and praise them for doing so. If your child wants to help out in the kitchen, don't just shun them for fear of them hurting themselves. 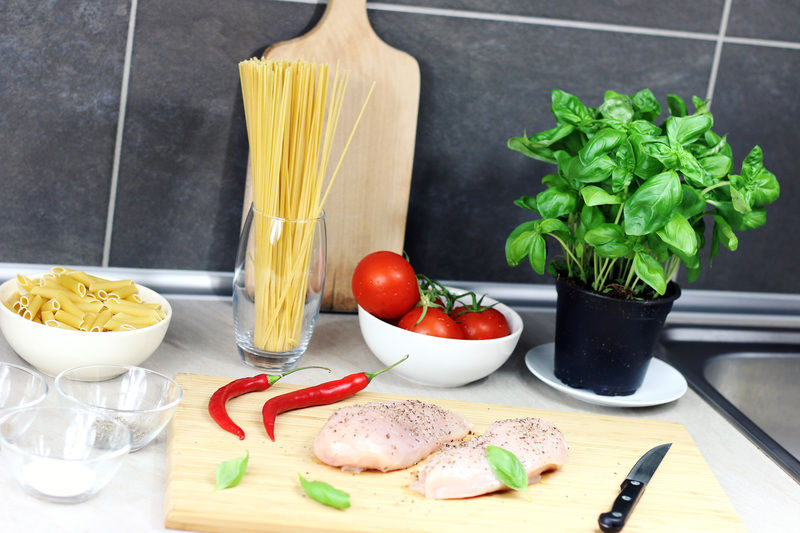 You can buy child-friendly cooking equipment such as safety knives which allow them to chop up food for you without putting themselves at risk. Also, simple things such as turning the panhandle away from you when cooking can keep children safe - they won't be able to grab at them this way. Oh dear thanks for those valuable words. I was really in trouble with my kitchen but now i think i'm gonna overcome.